Spices Indian Takeaway is located at Gloucester Road in Cheltenham. Excellent food is delivered straight to your door when you order online. Spoil yourself and order a starter, like Tikka Roll or Garlic Mushroom, to get your taste buds flowing. 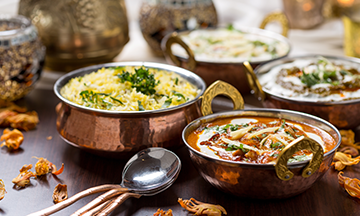 For your main meal how about a Balti Dish or their very popular and tasty Tandoori Dishes. Have a look at the “Chef’s Specials” category - the dish named “Some Like It Hot”. It is a lovely meal low in cholesterol, made with chicken or lamb tikka and cooked with very mild fresh chillies and garlic creating a special green herb sauce and is served with naan bread. Now first time in the Cheltenham area we have a highly experienced and qualified chef who is a graduate in Herbal Medicine. So, if you would like to know any information about your food (contraindication) or diet, please let us know. Brilliant food as always, quick delivery and friendly staff. Great food and friendly service! Will become my go to curry house! Brilliant food, fantastic service and great delivery time. Would definitely recommend. The chef's specials are amazing. Highly recommended!